Any kitchen can be made kosher. Whether your kitchen is up-to-the minute in fashionable design or a relic of the 1920's, whether you have a spacious "great room" or a tiny galley kitchen, you can readily adapt it to kosher practices. 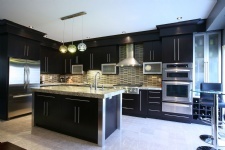 To have your kitchen Koshered or for more information please contact us.